Now I’ve got to the point where I’m balancing one on another and I keep looking out for them at car boot fairs, they can be in all sorts of states of repair and I end up making a handle and refitting this to the head. The two hammers on the left hand side are car boot finds. At the moment they all have different head shapes, but they are in the smaller size category. This next one shown in my hand was home made sometime in the 1950/60’s. 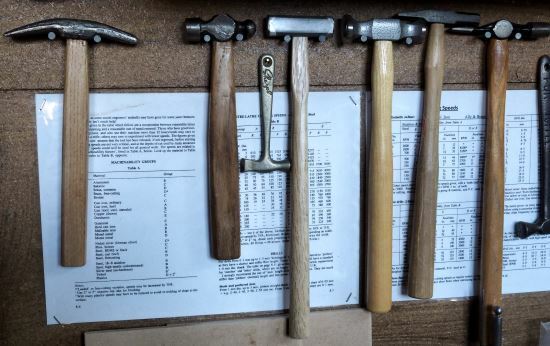 There is something very special about homemade tools as they have a quality that is just above all mass produced tools. 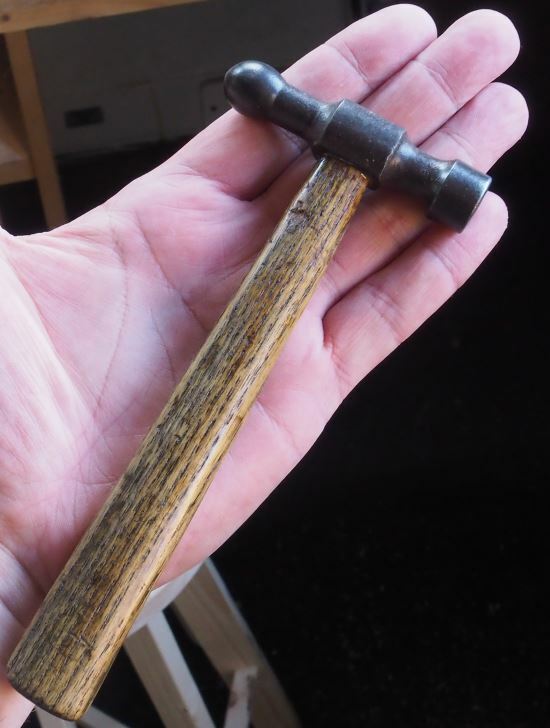 Once again an oak handle, but in this case this is the original handle from when it was made – I cleaned the handle with some methylated spirits to remove the grease and then lightly sanded it before varnishing. The head is a tight fit on the handle, but must admit that I used some epoxy resin to fix it in place with a long setting time. This gives a secure joint and in the case of the old wood handle avoids any possible further splitting that might result if I were to use a metal wedge tapped in from the top. 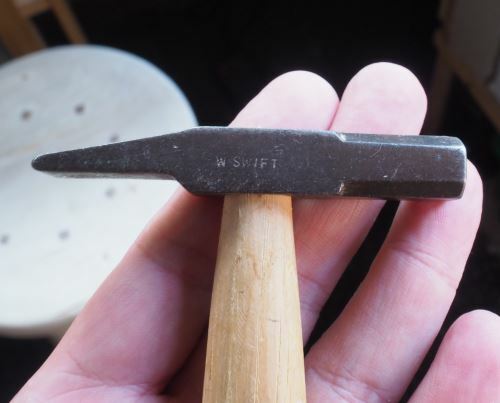 There is one aspect of collecting old tools and handmade tools that takes it all to the next level and that is finding a name stamped on the tool. To me this means that somebody really didn’t want to lose the item, they cared for it and looked after it. In addition this simple hammer on the right has an exquisite head, very simple in design but once again very functional and very well balanced in the hand.